Review of the Nutri Ninja Duo: Value for Money or Not? Nutri Ninja has made a splash in the blender industry ever since it came out a few years ago. Its blenders have features that rival those found in top-end models, yet their prices are comparatively cheap. The question is, are only the prices cheap? Or are the machines cheap too? In this review I set out to try and understand how capable a Nutri Ninja Duo was of handling every day blending/juicing of various ingredients. I wanted to help people try and understand whether this was a blender worth investing in, or whether it was better to just save up a little longer and go for a more high end option. 1 Why Is This Nutri Ninja Duo Blender Worth Considering? 2 What Is Auto-IQ in the Nutri Ninja Duo and What Does It Do? 3 What Do Customers of the Nutri Ninja Duo Say? 5 Where can I find Nutri Ninja duo replacement parts such as the Nutri bowl? 6 What’s The Best Price for the Ninja Duo Blender? 7 Verdict: Is This Nutri Ninja Duo Blender For You? Why Is This Nutri Ninja Duo Blender Worth Considering? It’s very powerful. Believe it or not, some blenders actually offer only 200 watts of power, which doesn’t really do much for ice cubes. But with the Ninja Duo you have at least 1300 watts of power, starting with the BL640 and 641 models. Its other models even have 1500 watts. That’s more than sufficient to dispel any worries that any ice cube or whole fruit is too tough for your blender. It has a special blade design that’s meant to really crush any ingredients you put inside it. You have 2 sets of blades that work together to make sure you get a delicious smoothie. First you have the “Total Crushing” blades which turn your ice cubes into snow in a matter of seconds. Then you also have the “Pro Extractor” blades that can break down whole fruits, vegetables, and seeds so that you don’t miss out on any health benefits from your green drink. Every model comes with a 72-ounce blender pitcher which allows you to make large batches of smoothies and juices all at once. You also get a variety of cups in various sizes, depending on the particular model you get. Available sizes include a Jumbo Multi-serve size cup which measures 32 ounces and a regular 24-ounce cup so you can make a drink to last the whole day. There’s also a small 18-ounce cup for those who like smaller servings. All these cups come with the “Sip and Seal” lids that enable you to bring your cup wherever you go without spilling the contents. Then you have recipes that give you some ideas on what drinks to make. Each one comes with the “Inspiration Guide” that offer basic recipes for smoothies and other treats. That’s what you get along with the Instruction Book and the Let’s Get Started guide. Others may also come with books written by noted nutritionist Rachel Beller. These materials include the 3-Day Jump-Start Plan along with the book “Simply Nutritious, Simply Delicious” which offers 75 different recipes especially designed for the Ninja. What Is Auto-IQ in the Nutri Ninja Duo and What Does It Do? Each variant of the Nutri Ninja Blender Duo with Auto-IQ comes with 5 distinct Auto-IQ programs, along with 3 programs for manual use. Essentially, this technology offers a 1-touch system that automates what you need to do depending on what you want to make and what container you use. The program will activate a unique pattern of pulses, continuous blending, and pauses to give you the best results for each type of treat you’re making. What this does is maximize the health benefits you get from the fruits and vegetables you put into the blender. At the same time, you get more delicious treats as well. The digital countdown timer counts down how much time is left for the particular Auto-IQ program when you use it. When you’re on manual mode, the timer counts the number of seconds for each pulse, blending, and pause. In other words, if you want to figure things out for yourself, it helps to take note of how long it takes for you to get the consistency you want when you blend or pulse. But you don’t have to figure out anything at all, as the automated program does everything for you with its unique “pulse, blending, and pause” patterns. The blender will recognize the size of your container automatically. All you need to do is choose a program and let it count down. If you want your smoothies thicker, just stop the blender a bit earlier than the program calls for. We recently reviewed the Nutri Ninja BL482, which also has the Auto IQ feature. What Do Customers of the Nutri Ninja Duo Say? Most people who have written Ninja Duo reviews online in ecommerce sites like Amazon, gave it full marks and wrote very positive Nutri Ninja Duo reviews. Fully 80% of the reviewers gave it a 5-star rating on Amazon and it now has an average rating of 4.7-stars. Just 3% of the reviews gave it a 1 star rating. Among the 10 most recent reviews, 7 people gave it 5 stars and the rest gave it 4 stars. Some of those who decided to buy Nutri Ninja Duo also own a top end blender like a Vitamix, and they gave the most telling compliment for the Nutri Ninja Duo Auto IQ when they said they prefer it over the more expensive Vitamix blender. With the power of the Nutri Ninja Blender Duo, customers have noticed a lot of improvements in their blending. A typical Ninja Duo review usually states that blending time now takes half the time that it did before. And they don’t have to worry about whatever fruit or vegetable they put inside the container. The Auto-IQ feature also gets a lot of compliments. Many appreciate the convenience it provides and they find it liberating that they don’t have to figure things out for themselves. But it also gives people a chance to customize their drinks. Some have recommended simply stopping the blender early when you’re more partial to thicker smoothies and soups. It’s that easy. In the morning when the brain is a bit fuzzy, those who have decided to try the Ninja Blender Duo are happy that they don’t have to think much at all before they get their morning drink to wake themselves up. Many also find the Nutri Ninja Blender Duo easy to clean, which is not always true of the more expensive blenders. You just pop the detachable items in the dishwasher, and you’re good to go. Even the recipe booklets are very helpful for most users. The directions are easy to follow and the recipes are even categorized according to the health benefit you want. So you have recipes for vitality, detox, beauty, heart health, weight loss, immune system, and even your mood. You also get recipes according to the kind of drink you want, so you have recipes for smoothies, soups, cocktails, pancakes, dips, sauces, and even popsicles. The recipe book has opened the eyes of many owners as to how versatile the Nutri Ninja Duo Blender with Auto IQ really is. Still, some people complain about the noise. But then again, there’s really no such thing as a quiet blender especially for powerful ones. The warranty situation is also a bit unclear as well, so you better check that out thoroughly before buying. To accomplish these different tasks, the Ninja Duo uses a precision prep blade assembly technology while the Ninja Ultima incorporates the dual stage blending system offering complete crushing and high-speed cyclonic technology. There is also a difference of power between these two models which should be considered if you plan on blending dense foods. The Ninja Duo has a motor which uses 1200 watts of power which allows for an easy implementation of the powerful “Nutrient and Vitamin Extractor” and the versatile “Nutrient Fusion Processor.” These are also featured in the Ninja Ultima’s 1500 watts, 2.5 HP motor, but it is unlikely that the average user is going to tell much of a difference between these two motors. Unless you are really concerned about the ability to blend very dense foods, both blenders have enough power to blend well. Finally, there is a difference of maximum capacity. The Ninja Duo blender pitcher offers a capacity of 9 cups of liquid, while the Ninja Cup only offers 2 cups. So, if you need the larger capacity, the Ninja Duo is the better option. With regard to the operating technology, the Ninja Nutri’s Auto-iQ technology, of course, features up to 5 intelligent programs providing combine specific timed action. Blendtec blenders use their own technology, where the mixer looks after itself, by monitoring everything from speed to operating temperature, to motor safety thanks to a flawlessly executing pre-programmed blend cycles. There is also a significant difference with regard to the blades of these two models. The Ninja Duo’s pro extractor blades provide for a full breakdown of whole foods, seeds, and ice cubes, therefore, unlocking the full potential of your fruits and veggies. Blendtec’s ultra-hard stainless steel single blades are cold-forged and tuned for heavy use. They are also corrosion resistant and come with patented vertical wingtips and precision angles for ultimate efficiency. The blade’s unique design makes all ingredients fall comfortably in front of the blades. The Ninja Duo’s motor has a 1200-watt base which allows for the efficient use of the nutrient and vitamin extractors and processors. Blendtec uses a commercial quality 1560-watt base, 3 HP direct-drive motor to run the counter top blender. So, the Blendtec model will be better is you really need the power. As we’ve mentioned before, the Ninja Duo uses the Auto-IQ System Total Crushing Technology. The NutriBullet, however, incorporates the scientifically advanced SMART Technology pre-programmed to turn at the right RPM, stop at the proper intervals, and run for a specific amount of time. It uses an exclusive cyclonic action to break down the cell walls of the food making the nutrients more potent. Power-wise, the models are fairly comparable. The Ninja Duo uses a powerful 1500 watt motor, while the NutriBullet uses a 1700 watt, 2.3 HP motor to comfortably break down the toughest of foods to their best absorbable state. The Ninja Duo has a few more pre-programed options than the Nutribullet which requires no input from the user. It has no on/off switch, speed adjustment and time settings. So, both mixers are fairly easy to use and utilize technology to take the guesswork out of blending. The Vitamix series of blenders are mostly comparable with the Nutri Ninja Duo. For example, the Vitamix 750 series also comes with 5 pre-programmed settings for crushing, blending, pureeing, etc. This makes both models good for those wanting a machine that is simple to use. The Vitamix series also typically comes with a smaller container: 64 ounces versus 72 ounces for the Nutri Ninja. Vitamix markets this as a “low profile” feature which fits better under the counter. However, both blenders should fit under most counters, so this may not be the great selling point that Vitamix supposes. For a blender of the same capacity and power, you will likely pay a bit more for a Vitamix blender (depending on any discounts), but Vitamix also makes smaller capacity blenders that meet the price point of the Nutri Ninja. So, if you are looking to save a few dollars, the Nutri Ninja is probably the best option. Where can I find Nutri Ninja duo replacement parts such as the Nutri bowl? Nutri Ninja is a well-establish company in the blending market. Because of this, their replacement parts are readily available. Be sure to check that they part you need is not covered under your warranty before you purchase a new part. 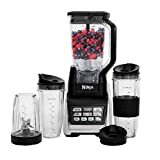 However, if you do need a replacement, these parts can be found through both Amazon (with some limitations) or through the Nutri Ninja website. What’s The Best Price for the Ninja Duo Blender? Online you can get a Ninja Duo Blender for less than $250. That’s actually more than reasonable, when you consider the fact that other models can go for as much as $500. The price marks it as a top-end model, but in that category it’s among the most affordable. Prices from retail shops can vary, but you can expect a higher price when you buy it from a local store. The prices are much better online, especially on Amazon, where some sellers offer substantial discounts to attract more buyers. One thing to keep in mind when looking on Amazon is that prices may change on any given day. This is why i can’t give you a price right now. You can check on Amazon for the best price TODAY at this link. Verdict: Is This Nutri Ninja Duo Blender For You? First of all, are you willing to spend $250 for a blender? If yes, then the Nutri Ninja Duo Auto IQ is a good choice. Sure it’s expensive compared to most blenders out there but the Nutri Ninja Blender Duo is hardly average. It works very nicely and can go head to head with other advanced blender models that cost twice as much. The Ninja Duo is also very useful for those who still need help figuring out the blending settings and the pulse action. After all, it’s not just a matter of using the blender and the pulse setting for a few seconds. With the right pattern of pauses, pulses, and blending, you can prepare the healthiest drinks that taste great even young kids will love it. With the Nutri Ninja Duo, you get delicious smoothies and healthy treats without any real difficulty and with minimum cleaning required. You can make solo preparations or drinks for the entire family in one go. This blender is durable and you can expect it to last for many years. If you want all these features in a blender then go ahead and buy the Ninja Duo. Can I make hummus in the blender? with no problem. 1 minute! Read Next: Blendtec 575 Classic Review: Better than a Vitamix?